For those interested in seeing last week’s panel discussion on the future of the New York Public Library, check out the video on their website. I think you’ll find in illuminating as I did. Last Tuesday’s forum on the fate of the New York Public Library’s 42nd street flagship turned out to be quite different than I or anyone else expected. For one thing, Anthony Marx and Robert Darnton attended the event (after turning down an earlier invitation). For another, both engaged in a frank and fruitful discussion with critics of the Central Library Plan, including Joan Scott, Charles Petersen, Eric Banks, David Nasaw, and me. Robin Pogrebin covered the event for the Times, and there has been interesting press coverage in other venues. I am hopeful that the dialogue will continue, and that Mr. Marx will make good on his offer to rethink this very shortsighted plan and come up with an alternative that leaves the stacks alone. This piece of very good news is already tainted. I have been invited to participate in a panel discussion of the Central Library Plan next Tuesday evening at 6:30 PM at the New School in Manhattan. There I’ll be able not only to hear the concerns of some of the leading scholars and writers in the U.S., some of whom will be fellow panelists, others audience members, and add some of my own, in a frank discussion of the New York Public Library’s campaign to destroy the stacks in its landmark building at 42nd Street. The bad news is that there won’t be a representative from the NYPL board or administration at this important event. Cordial, personal invitations conveyed by respected academics and writers were spurned. This is a shame, a very public shame. 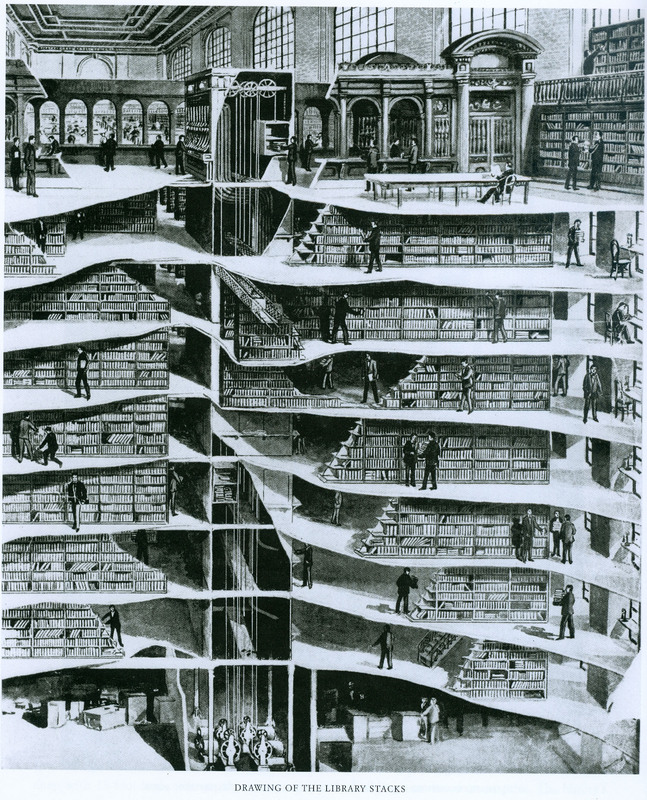 A colleague at the SAH put me onto this wonderful web page with a tour and history of the incredible technology that went into the NYPL stacks in 1911. You’ll be amazed when you read about them. And it may reinforce your determination to keep the Central Library Plan from being realized.